The Apache are a semi-nomadic tribe with ethnic ties to the Navajo. While the Navajo settled down in certain areas of the Southwest, Apaches ranged over Mexico, Arizona, New Mexico, Texas and Oklahoma, following the hunting. The Apache are well-known for putting up staunch and effective resistance to Mexican and American governments during 17th and 19th century confrontations. The Spanish and Mexican people were the first to feud with the Apache and quickly learned the tribe was skilled in the ways of war. 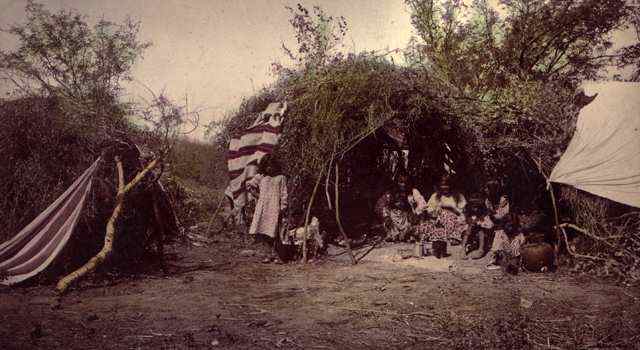 Throughout Apache Indian history, the tribe obtained much of what it needed through conducting raids. While Apaches traded with European and American explorers and settlers, it was also part of the tribe’s culture to take what was needed. Raiding was always done for profit, and not considered an act of war by the tribe. Warring was conducted in large parties and was typically an act of retribution. Mexican settlers found themselves in a series of skirmishes with the Apaches, who would raid settlements for horses and other stock. In an effort to stop the raids, the Mexican government offered a bounty for Apache scalps. American, Mexican and European profiteers alike heeded the bloody call, killing hundreds of innocent and peaceful Apache in an effort to collect as much bounty as possible. Most of the fighting between Americans and the Apache people occurred between 1849 and 1886 during the Mexican-American War. In 1849, the U.S. specifically targeted the Apache tribe after a group of settlers were killed by Jicarilla Apache raiders. Violence between the Apache and Americans would continue throughout the Southwest. However, the most well-known war in Apache Indian History is known today as Geronimo’s War. Geronimo was a skilled medicine man and Chiricahua Apache warrior who battled and eluded American forces for years, launching several successful attacks. American expansion was a tough time in Apache Indian history. The tribe found itself stuck between two powers, Mexico and the U.S., who were battling for territory in what is now known as the American Southwest. These struggles play an important role in understanding American Indian history.